From the Gallows is this past season of The Walking Dead distilled into a single episode. Every save glitch, every charming line of dialogue, every fully-realized character, every thinly sketched character, every well-blocked scene, every workmanlike visual, it's all here. 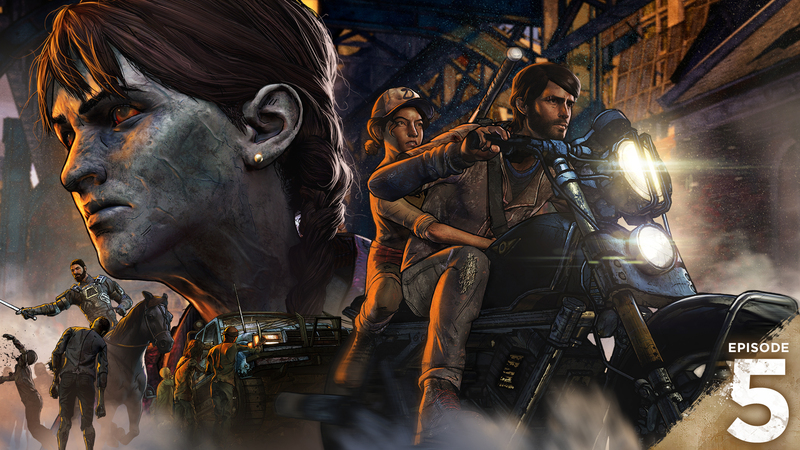 These elements have been present across A New Frontier – some of them more dominant than others – so it's clear Telltale understands exactly what this game is. Good for them. From my perspective, the credits have rolled, my time with A New Frontier is done, and I don't know that I can give it the hearty recommendation I assumed I would be delivering back in December. The gulf in quality between how well the season opened and how middling this finale turned out to be is a lot to surmount. It's not a terrible capper, but it's certainly not what I hoped for. I thought we'd be seeing a legitimate contender to the Telltale throne, one that looked to tell a character-driven story about family of blood versus family of circumstance. I don't think I've ever seen a video game obstinately refuse to address themes it previously introduced, but I suppose there's a first time for everything. Although the characters get a decent send-off, the finale really lets the whole season down – which doesn't bode well for Season Four. The Walking Dead as a franchise has always toyed with the idea of "family" as an overarching theme, but that's usually been a part of a larger story in the comics and TV shows. 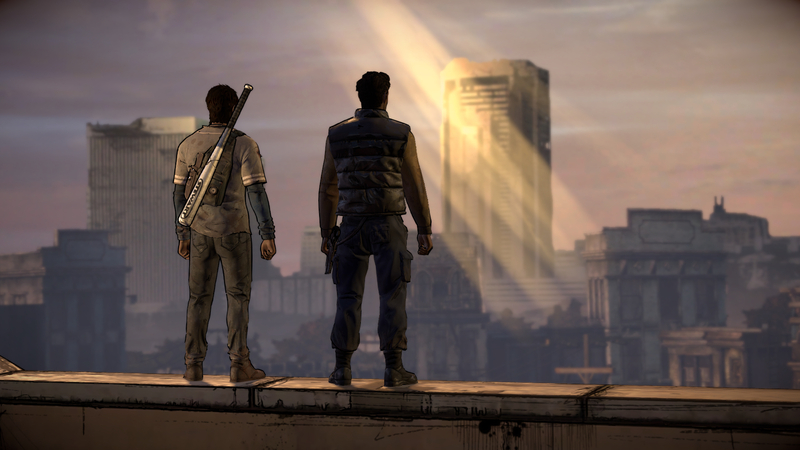 But in Telltale's The Walking Dead, that's been the emotional core from day one. You had Lee and Clem in Season One, Clem and Luke/Kenny/Jane/AJ in Season Two, and now the Garcias in Season Three. Season One worked because Lee's relationship with Clem developed naturally, buoyed by Clem's natural charisma. In Season Two, the relationship between Kenny and Clem worked because Kenny was Clem's last tie to the group in Season One – to her father figure Lee, and the last months of her innocence. The Garcias took some of the best aspects of those stories and combined them, sort of like a Good Frankenstein. They were a mostly intact family unit who had seen years of the zombie apocalypse, each with a strong basic character archetype and relatable motivation. There was a lot of promise there! Adding David to the mix after the main cast had been established was a great idea, shaking up the dynamic the player had been building over the first two episodes and foreshadowing some legitimately interesting conflict. The pre-apocalypse flashbacks let the characters breathe a little bit, and the relatively calm pace of the season thus far let you keep those threads going. It was great! And then...I don't know what happened. It feels like A New Frontier suddenly realized it was a choice-based adventure game, so in Thicker than Water there needed to be immediate and harsh consequences for your actions, regardless of where the characters were in your particular game. Running through all your choices to properly set up the finale is par for the course when it comes to Telltale, but that episode felt like somebody else was imitating what they heard you were supposed to do in a Telltale game. And to cap everything off, the episode concluded on a cliffhanger where it seemed like the game was using a woman's death to motivate two dudes who were both horny for her. Although I'm happy to be wrong about where that plot thread was going, the way From the Gallows resolves the situation isn't great either. From the Gallows seems more concerned with bringing an end to the plot rather than exploring the season's themes head-on. So it's satisfying to see the story end in a definitive place but you can't help but feel like a piece is missing. A New Frontier has been constantly asking the player how they define family: is the family you choose more important than the family you were born into? I struggle with this question in real life, so I decided to have Javi come down on the same answer I keep coming back to: blood is pretty strong, but not strong enough to get away with anything. Neither of the options presented by the Big Final Choice were exclusively defined by the two sides of the argument the season had been presenting. In both cases, it was a mix of blood family and family of choice. The family members in question are as compelling as ever, although sometimes they go off the rails in service of a branching story. Hell, there were moments where I thought the game was actually going to get me to care about David – an unprecedented feat! – only to have the guy act like an enormous jerk a few scenes later for no other reason than to force a major choice between two other characters, with both roads leading in obvious directions. 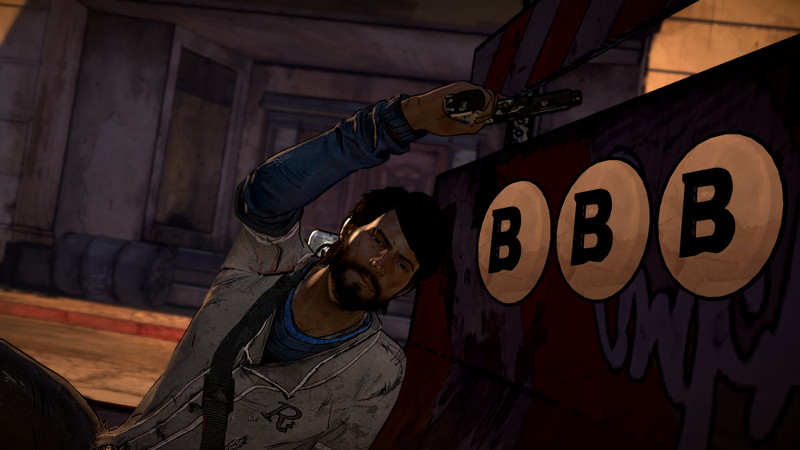 If you thought Telltale was going to stop pulling that exact trick, you would be sorely mistaken. Thankfully, when they're not serving the demands of the plot, the rest of the cast still plays off each other very well. 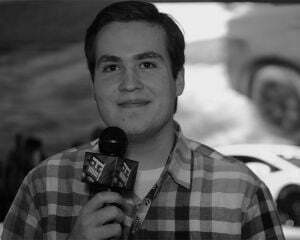 Javi is a charismatic guy, unquestionably acting as the heart of the group while still being able to get things done. Clem has fully warmed up to the Garcias by this point, Gabe is starting to think before he acts, and to say any more about the group dynamic would be a spoiler. If you've come to like these people over the season, you will likely find some measure of contentment with their character arcs. I wish the game had put them through the ringer a little bit more (half of the episode feels like a victory lap, even before the part of the game that is actually supposed to be the victory lap), but if this is the last we see of the Garcias, I'd be okay with that. From the Gallows also continues the season's trend towards legitimate cinematography, albeit with a sort of half-measure. The camera makes full use of the improved graphics engine, using bloom and color to draw the eye, but then you have scenes where the game could've used just a little bit more flair to drive home the emotion behind the shot. A New Frontier has been imitating film the whole time, right down to the camera having to pull focus like there's a cameraperson with a real lens, but I don't think they're all the way there yet. I don't mind the growing pains so much if this means Telltale is going to keep experimenting with scene direction. 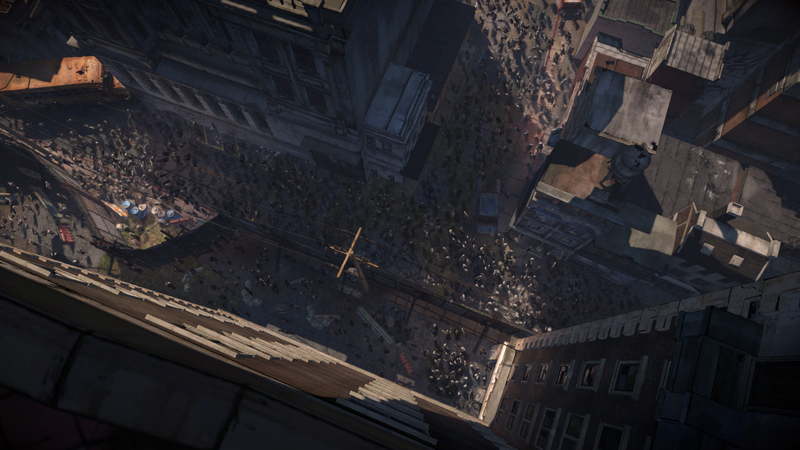 This new engine doesn't look half bad, especially in a stylized comic book world. There aren't any movement glitches, the loading times are fine, no texture pop-in; this is arguably Telltale's best-playing game in quite some time. But of course, like a tub of water displaced by a handful of turds, the cosmic balance has decreed other parts of this game must be extra broken to make up the difference. A New Frontier ate my saves for episodes two and three somewhere between when I shut down my desktop after playing episode four, and when I turned it on again to play From the Gallows. I didn't notice until people started talking about Conrad like I hadn't already put a bullet in that dude's head, which leads me to believe there are plenty of smaller details I missed seeing thanks to a default spreadsheet making my choices for me. To have my saves go missing twice over the course of reviewing this game is absolutely unacceptable, especially when you consider this is Telltale's ninth Walking Dead-like. I was using two different kinds of cloud saves, including Telltale's proprietary system, and that still didn't help. The Javi I had built over 18 hours (because I had to play the game twice already) was gone, replaced by a man I didn't recognize. Telltale has been out there talking up From the Gallows as an episode driven entirely by player choice, but that's impossible for me because half of my choices disappeared while I wasn't looking. There was also a weird glitch where Tripp was strolling through the background during a highway scene, and that's super odd! Because in my game, Tripp has a very well-ventilated skull, if you catch my drift. Even though I found A New Frontier ultimately disappointing, I do kind of respect this particular brand of disappointment. The first couple episodes were promising, in part because I'll honestly take any chance I can get to cut my teeth on serialized character development and evolving thematic undertones. But even with that aside, the Garcias were likable and it seemed like Telltale finally understands how to write an older Clementine correctly – too mature in some areas, too immature in others. However, somewhere along the way, the mechanics and story cheats embodying Telltale at its worst all crashed down on this series at once, leaving a messy final episode failing to do right by the game's overarching story. If A New Frontier is a sort of mission statement for this franchise going forward, does it succeed in making me want another season of The Walking Dead? I know I don't want the Season Four they're selling (which is set up in a manner that makes me think Telltale is threatening me personally) but if we're looking at this season by itself, as a whole the character work in A New Frontier does a lot to make up for the finale's shortcomings. I got the ending I wanted, but I wouldn't have wanted a specific ending if I didn't care about these people and where they ended up. A disappointing finale doesn't completely undo the goodwill earned by the rest of the season, but a sour aftertaste is still pretty hard to wash out.